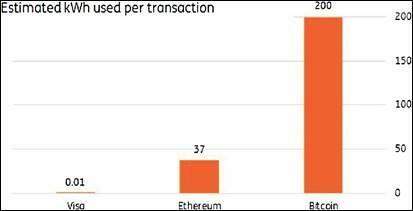 They say money doesn’t have color, but Bitcoin certainly isn’t green — a new study reports that energy-intensive transactions are becoming a real problem, up to the point where they are becoming a real problem for several countries. Bitcoin’s peer-to-peer transaction verification is a polluting process, requiring machine hardware around the world to run at a high rate for 24 hours a day, producing vast amounts of heat and emissions. Image credits: Jon Truby / Energy Research and Social Science. Bitcoin brought the world of cryptocurrency to light, but there’s another, darker side to it. Bitcoin’s surging prices have massively raised interest for mining blockchain, which is an extremely intensive process. According to one estimate, the Bitcoin network is consuming power at an annual rate of 32TWh, which as about as much as Denmark, and significantly more than several countries. But it’s not just mining — according to the same estimate, each Bitcoin transaction consumes 250kWh, enough to power the average American house for nine days. Jon Truby, Assistant Professor at Qatar University in Doha, Qatar, works on evaluating the financial and legal framework surrounding blockchain technology such as Bitcoin. He studies how blockchain is owned, how it is transacted, and what the consequences of this new network are. According to Truby’s new analysis, Bitcoin’s current habits are generating way too much carbon emissions, up to the point where it may interfere with national climate change mitigation obligations. In other words, Bitcoin has a lot of greening up to do. The main problem, Truby says, is that no actors in the Bitcoin scene have any interest in reducing the environmental impact. This is where policy would enter the stage. Bitcoin’s mining system somewhat resembles actual mining: the costs and efforts required to mine rise as the system successfully extracts more and more resources (in this case, blockchain). These rising efforts manifest themselves through increased consumption of energy. This is ironic and counter-productive since blockchain technology — which decentralizes and transforms the exchange of assets through peer-to-peer verification and payments — has been advocated as being capable of delivering environmental and social benefits. While that would be great, that doesn’t seem to be the case considering the current energy consumption patterns. “Bitcoin is here to stay, and so, future models must be designed without reliance on energy consumption so disproportionate on their economic or social benefits,” Truby explains. Registering fees collected by brokers from digital coin buyers. Implementing a “Bitcoin Sin Tax” surcharge on digital currency ownership. Adding green taxes and restrictions on machinery purchases/imports (e.g. Bitcoin mining machines). Having smart contract transaction charges. As Truby further writes in the study, it’s not just about penalizing energy-consuming blockchain users — it would also hopefully result in innovative ways to reduce blockchain-associated emissions. Thus, new rewards could motivate the development of carbon-neutral currencies.